The Economic Times of India reported on January 24, 2014, that a stunning diamond necklace designed by Nirav Modi, a third-generation diamantaire, internationally renowned jewelry designer and chairman of Firestar Diamond, will be the top highlight of the Sotheby’s Hong Kong Magnificent Jewels Sale coming up in April 2014. 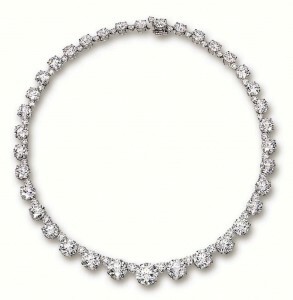 The necklace with a starting bidding price of $8 million (Rs. 50 crore), is made up of 17 high-quality diamonds, mostly sourced from Russia, and took nearly 1,500 man hours to make. The largest diamond in the necklace is a 10-carat stone and the smallest a 2-carat one, adding up to a total of 85 carats.”It took us two years to source all the diamonds, which represent characteristics similar to ones from the Golkonda region,” said Modi. According to experts, traditional jewellery that’s of historic significance, generate a high degree of interest among buyers across the globe. High-profile buyers are keen on pieces that are studded with Golkonda diamonds or Kashmir sapphires in vintage designs with intricate detailing and rich provenance. However, what makes a contemporary Indian designer, like Nirav Modi’s designs and brands to command such high values at global platforms ? “It’s the craftsmanship, design, along with the quality and rarity of the stones used in the piece,” expains Modi. Modi has had some 20 of his pieces auctioned by Sotheby’s and Christie’s in the past four years. At a Christie’s Autumn Jewellery Auction in 2010 Modi’s exquisite Golconda Necklace was auctioned for Rs. 16.29 crore, equivalent to US$ 2.62 million. At another Hong Kong auction by Sotheby’s in 2012, Modi’s Riviere Diamond Necklace was sold for US$ 5.1 million (Rs. 32.25 crore) to an Asian buyer. Modi was the first Indian jeweller to be featured on the cover of Christie’s Hong Kong auction catalogue along with such reputed names as Harry Winston, Cartier and Van Cleef & Arpels.